Based on a teach-yourself approach, the fundamentals of MATLAB are illustrated throughout with many examples from a number of different scientific and engineering areas, such as simulation, population modelling, and numerical methods, as well as from business and everyday life. Some of the examples draw on first-year university level maths, but these are self-contained so that their omission will not detract from learning the principles of using MATLAB. 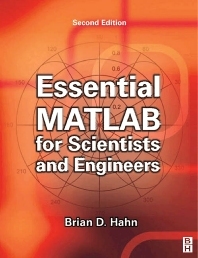 This completely revised new edition is based on the latest version of MATLAB. New chapters cover handle graphics, graphical user interfaces (GUIs), structures and cell arrays, and importing/exporting data. The chapter on numerical methods now includes a general GUI-driver ODE solver.